Help us get to 4,000! There is on-going pressure on governments to impose state control on property investors through a warrant of fitness regime on privately-owned rental housing. The viability of your rental would then fall into the hands of a council bureaucrat with a clipboard and a timesheet as he inspects your property against a wide array of subjective criteria – including the imposition of new building code requirements on existing rentals. 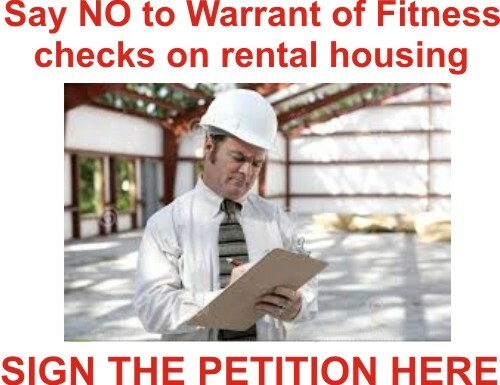 If you see this as an attack on private property rights, then please sign this petition urging the Minister of Housing to reject any proposal for a warrant of fitness on rental housing. You can read the original background paper about the vested interest environmental and public health groups pushing for a rental housing warrant of fitness HERE. We also have updated material HERE and a detailed report HERE. People power is needed to fight attacks on landlords. Please encourage private rental property owners throughout the country to become aware of the threat on their livelihoods and speak out against increasing regulation on rental housing.